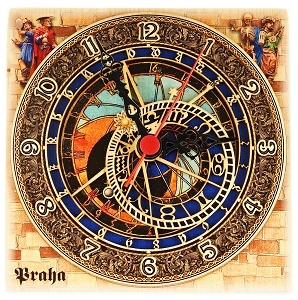 Wooden clock created as a model of Astronomical Dial, the main part of the Prague Astronomical Clock. 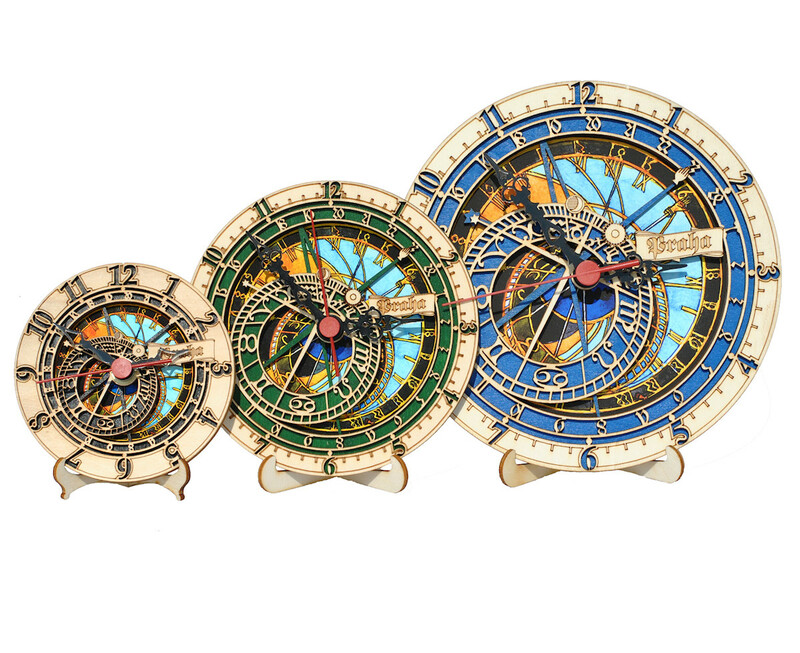 The real Dial can show four kinds of time at once. 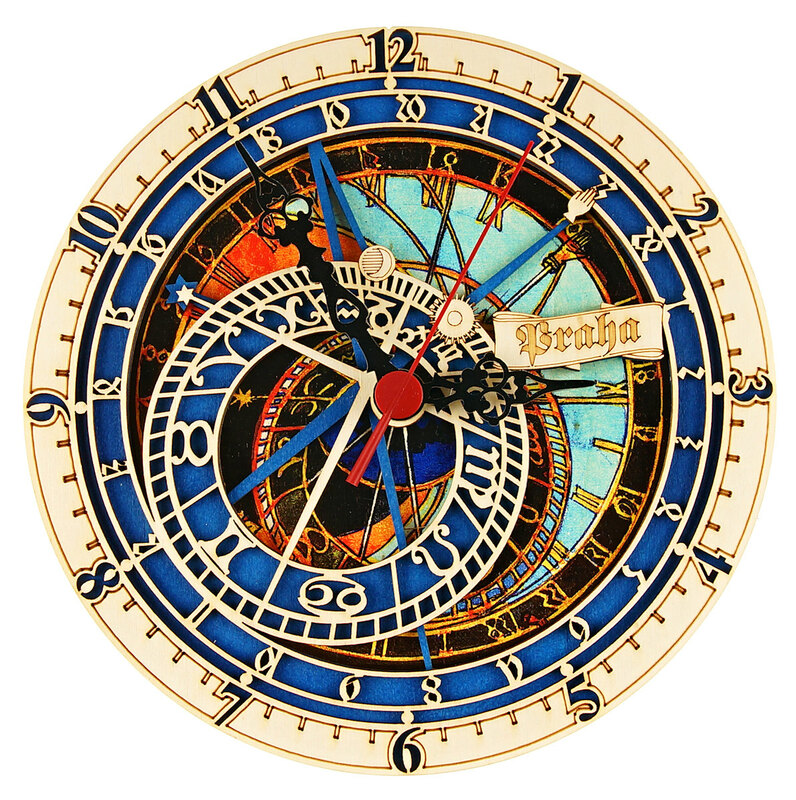 This product models all structures of the Dial and shows single time using standard electric clock engine with three hands. Please see the Picture Gallery for photos of the real Clock to compare. 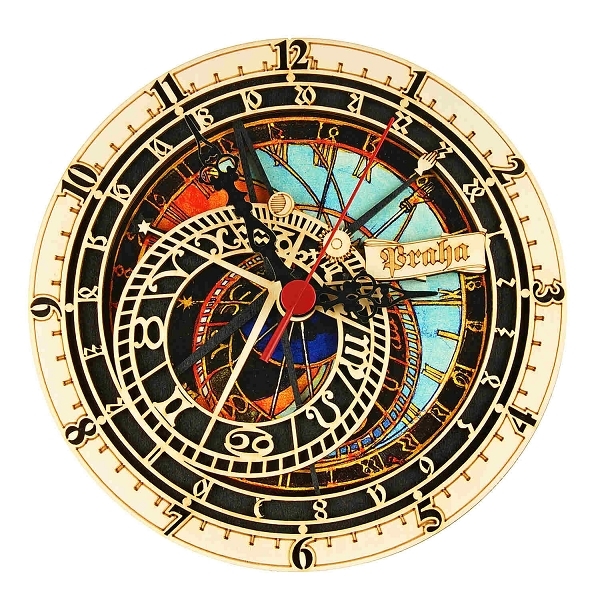 You can hang this clock on a wall or put it on a table - it comes with a small detachable stand. Designed and made in the Czech Republic. Includes one AA battery. 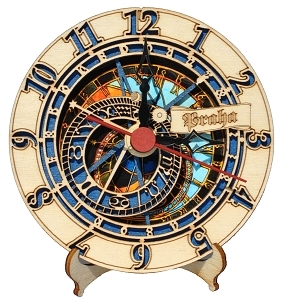 This clock comes packaged in brown carton box with round opening on the front side - please see the picture. 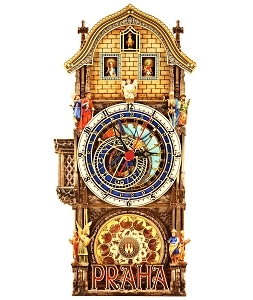 This wooden clock would make a nice corporate gift to participants of your event or tour in Prague. Please get in touch with us to obtain a quote tailored to your needs by sending an email to mpthiele@vtravelmemories.com or calling +420 724 067 394 during CET business hours. We keep around 30 pieces of this product in the warehouse most of the time so we are able to respond to your event needs quickly. We can manufacture hundreds of pieces in a week, thousands in two-three weeks. Please check the Quantity Pricing scheme to see the volume discounts for bulk deliveries. If you need to receive a product sample for evaluation, please order it from our store and indicate "product sample" in the note. We will then deduct the product and standard shipping price from your invoice for the resulting bulk delivery. If you need to get a sample very quickly, please come back to us using the above contact details so that we can determine which door-to-door express shipping service will suit your needs best. 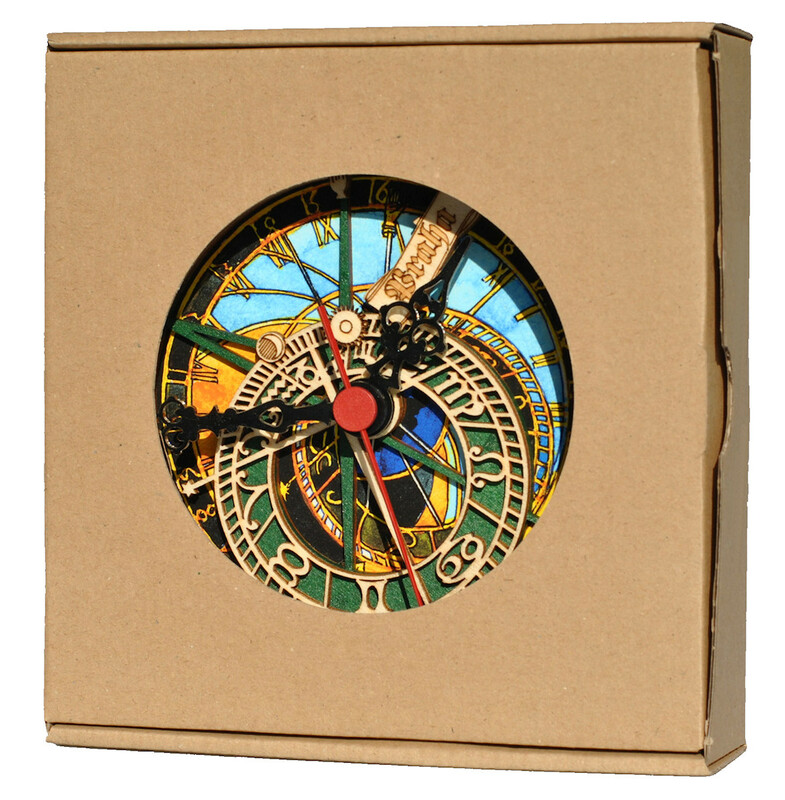 We can deliver the clocks in their regular brown carton boxes or apply desired kind of gift wrapping. You can have them wrapped with glossy paper of your choice or inserted into paper conference bags. We can also apply ribbon of matching color on top of the wrapping paper. 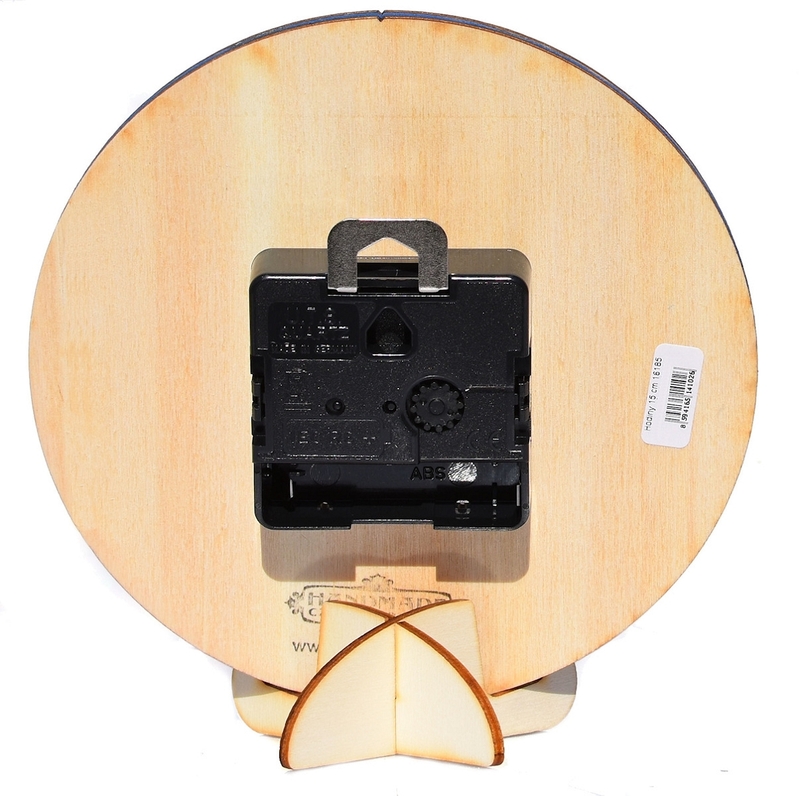 - We can manufacture special series with modified design of the front layer. We can add short text and/or a logo to it. - We can apply engraving on the back side. Please note the minimal order amount of customized products is 50 pieces. We will personally deliver the packaged or wrapped products to any venue or hotel in Prague for no extra charge, on time for your event and following your exact directions.